I can’t help myself. 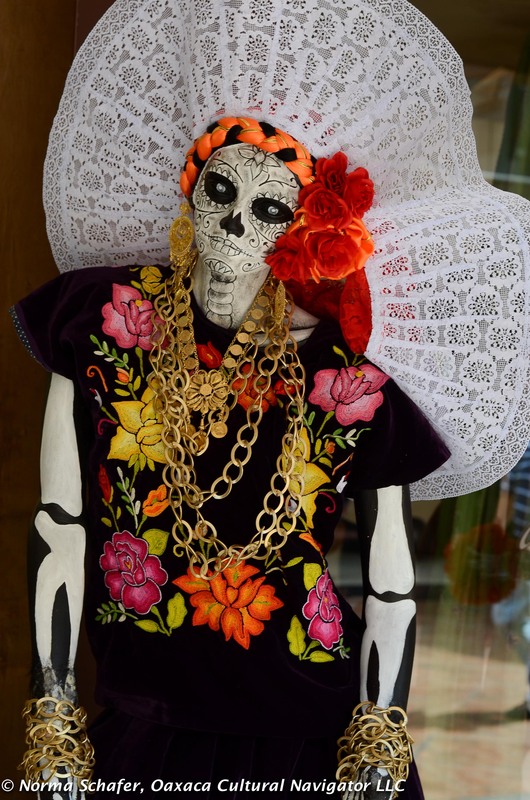 Those flamboyant, extravagantly costumed Catrinas, made famous as a Dia de los Muertos symbol by political cartoonist Jose Guadalupe Posada, are starting to pop up all over town. 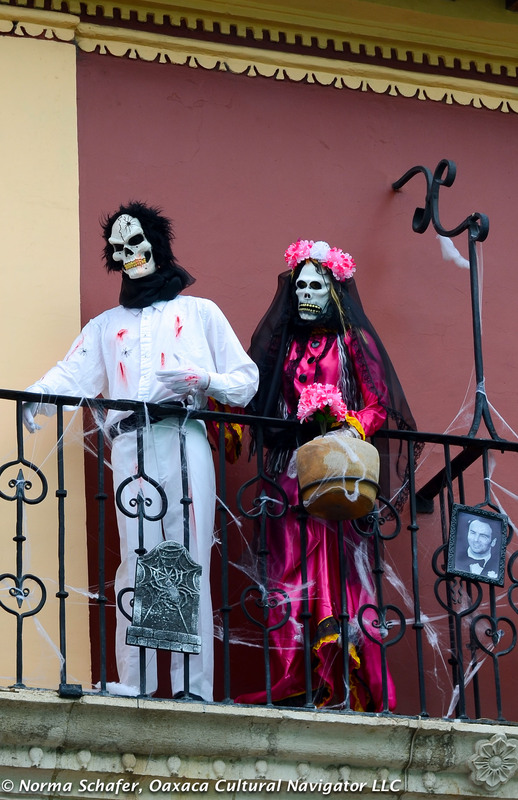 Day of the Dead is a big deal in Oaxaca, Mexico. As I walk the cobbled streets and uneven sidewalks, I remember to look up (as well as down to make sure my footing is solid). 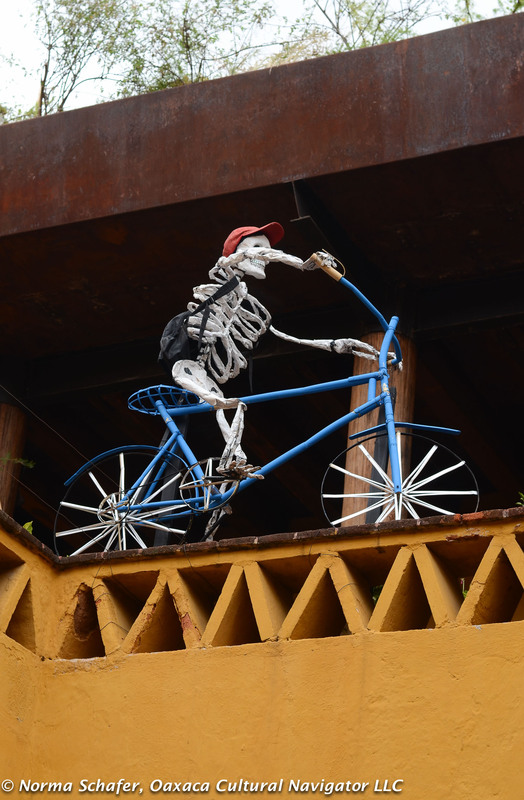 There are Calaveras on rooftops and leaning over balconies here in Oaxaca, too. 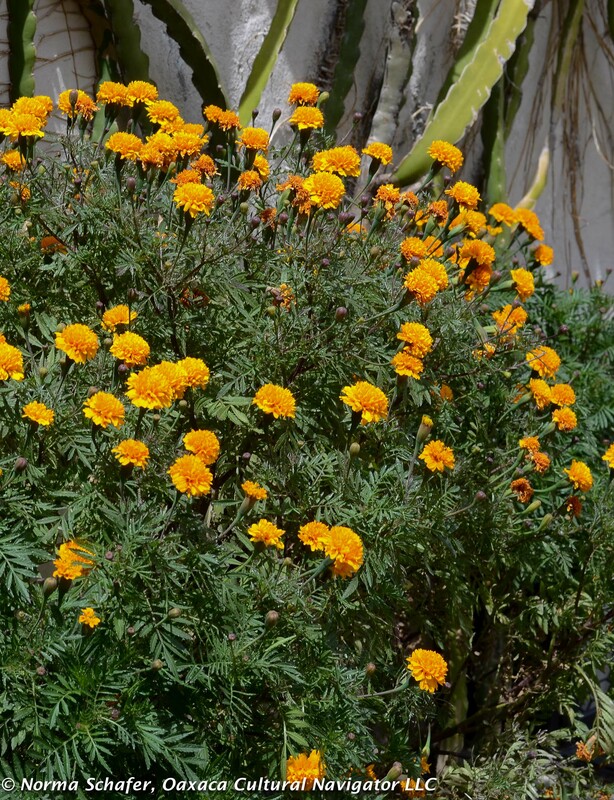 Of course, I have to photograph them and the golden marigold flowers that are coming into full bloom. 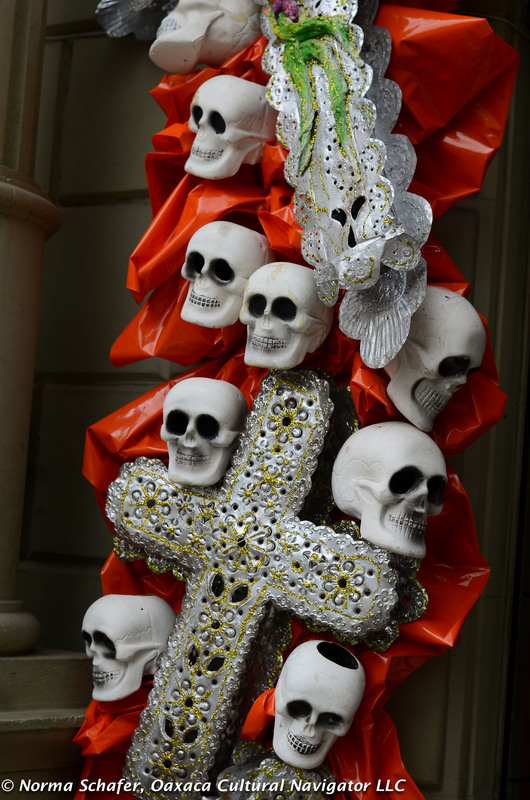 Their fragrance guides the dead from the other world back to this one for the annual visit to loved ones still living. 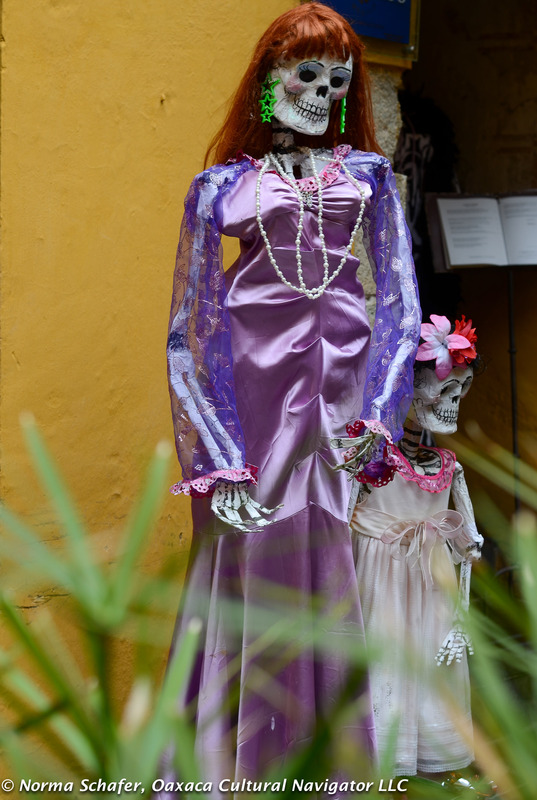 Whimsy, fun, mockery, parades, joyfulness and celebration are all part of Day of the Dead. Local people take the return of their loved ones seriously. They are deadly serious. 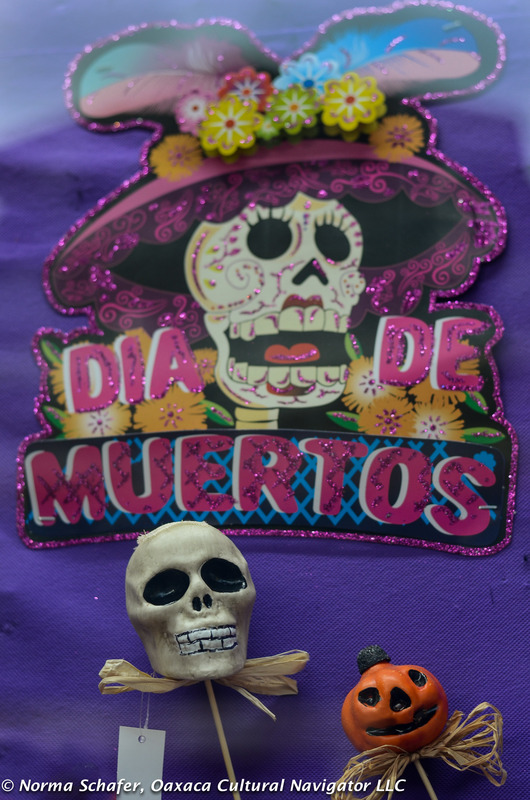 One mother I know from El Norte who lost her adult son this year to a rare illness, is waiting with family in her local village for Muertos when she will be with her son again. 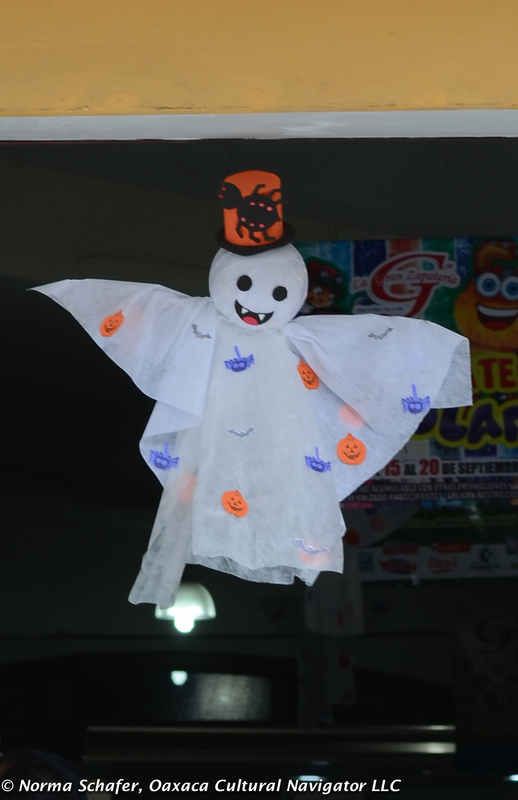 This is a pre-Hispanic tradition based in belief and mysticism, attached to the harvest season when all that lived returns to the earth. We have two weeks to go but the energy is building. 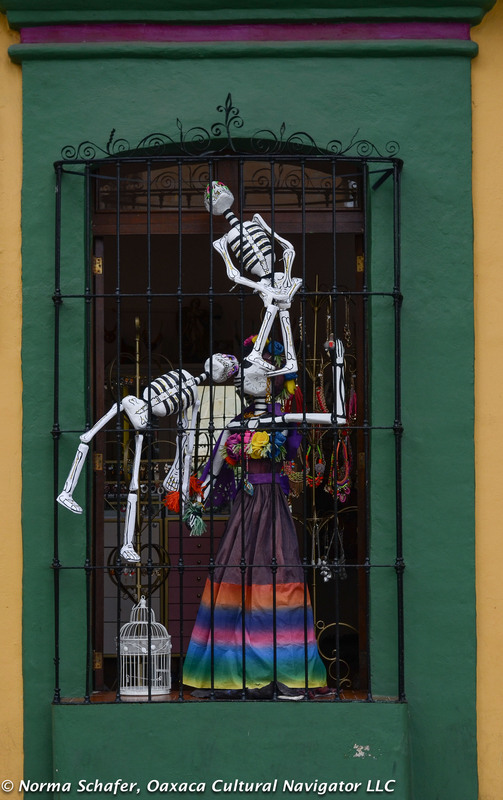 Shop windows lure the eye with decorations that are uniquely Oaxaca plus a blend of Halloween, an adaptation of commerce brought to Mexico by the U.S.A. 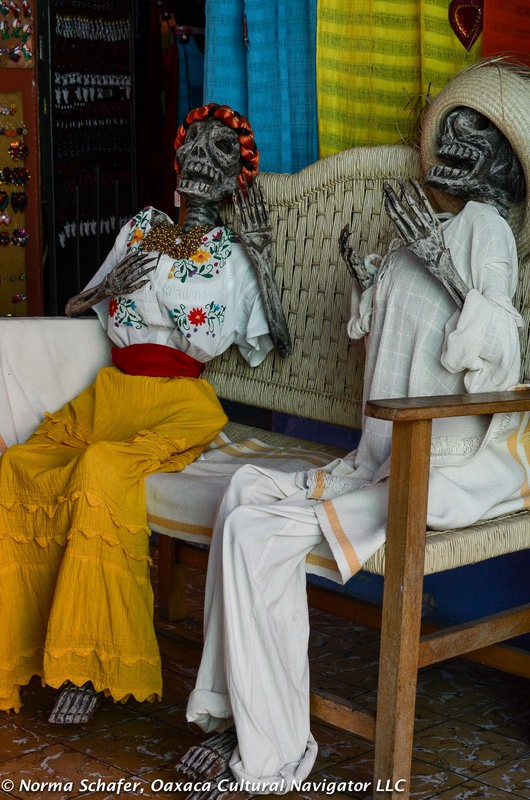 So, we see a blend, a syncretism of sorts, of plastic pumpkins, witches on broomsticks, ghosts, candy corn, spiders and gauze integrated with skeletons riding bicycles, skeletons wearing rebozos and skeletons dressed in indigenous clothing. 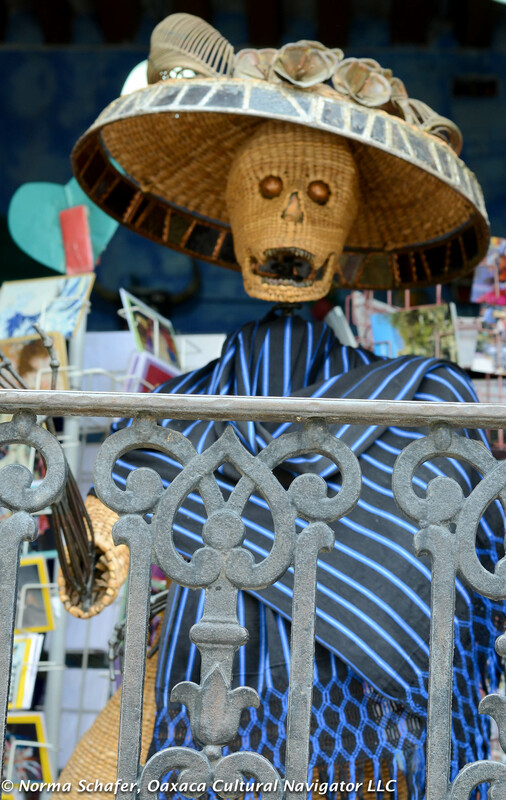 My vote for the best decorations is the patio entrance to Los Danzantes Restaurant. Today, I went to the printer to make a copy of a special photograph of my dad who died in 1997. I’m thinking about the altar I will build where I will display his photo in memorial, light copal incense and guide his spirit back to me. He wasn’t a drinker, but he liked a beer on a rare occasion. It really didn’t matter what kind. So, maybe a Victoria will go on the altar along with fresh fruit and a 24-hour candle whose flame will remind me of life, death, memory and the commitment to honor a beloved parent. 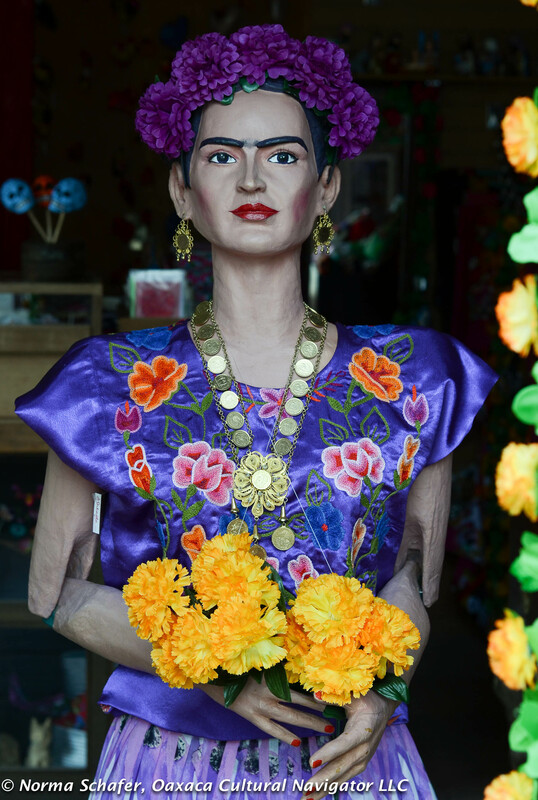 As I passed through the Zocalo, I noted doorways decorated with flowers, young boys tossing balloons, mothers and fathers strolling with their infants hugged to their bosom or nestled in carriages. A bandstand was set up awaiting the next performance. More tourists are in town meandering, eating in outdoor cafes. 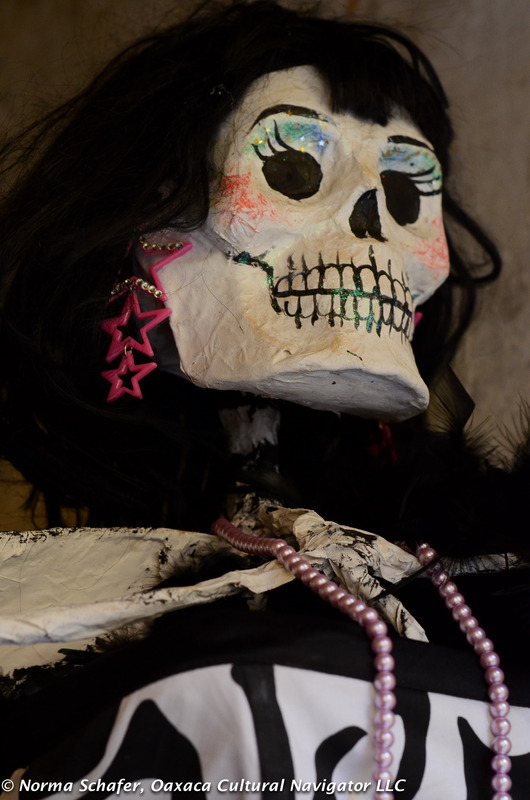 Soon Muertos will be here. Another opportunity to count blessings, to appreciate life and to honor those who gave it to us. 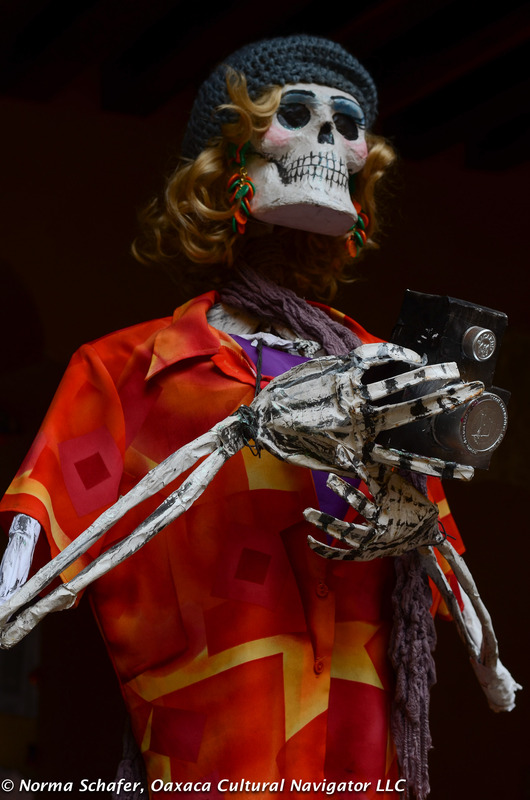 This entry was posted in Cultural Commentary, Oaxaca Mexico art and culture, Oaxaca travel, Photography, Travel & Tourism and tagged calaveras, Catrinas, day of the dead, Dia de los Muertos Oaxaca, Mexico, Oaxaca, skeletons. Bookmark the permalink. Thanks for the photos and article,Norma. 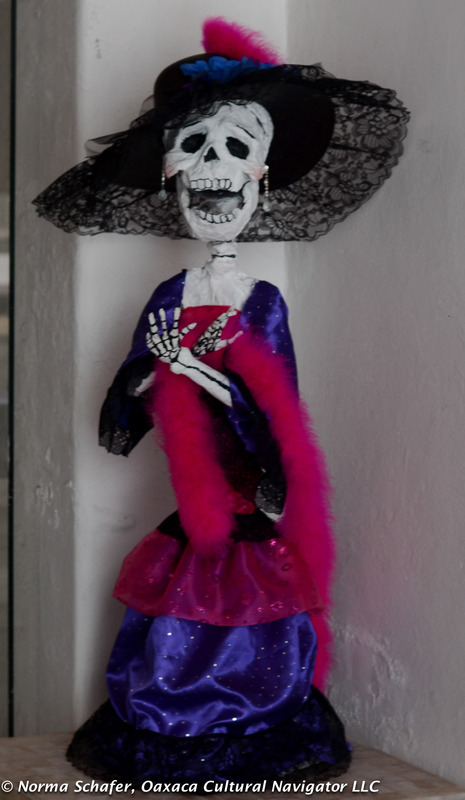 I’m àlready missing the love and fun of Dia de los Muertos, but will be back “home” next year. Carolina, come home! NC is no place to spend the winter when it rains ice. Besos. 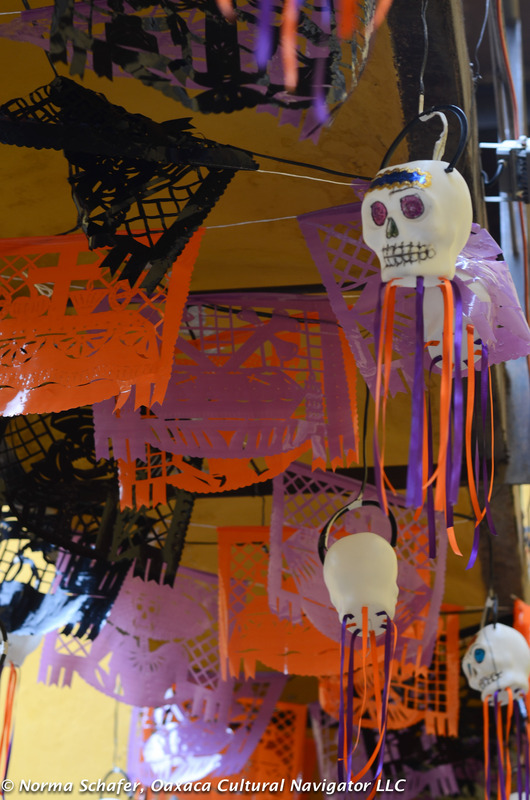 I was moved by your two-weeks-away comments about Muertos. Thank you. 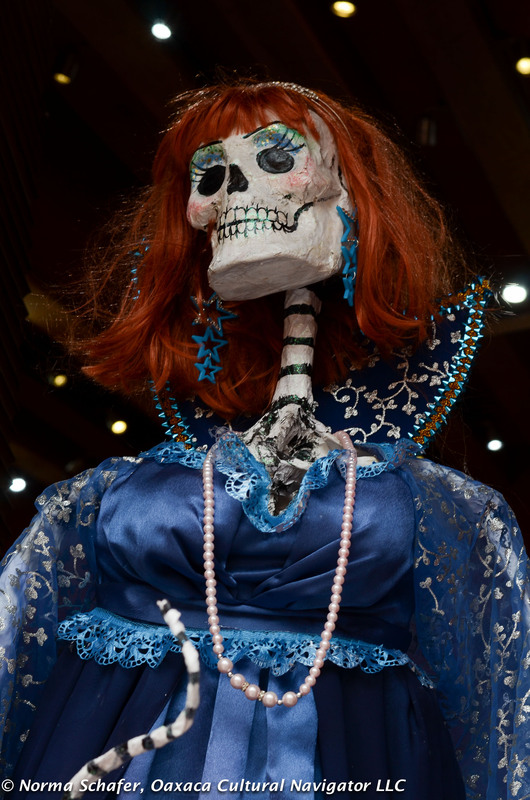 Hola Amiga. We are here, just arrived. 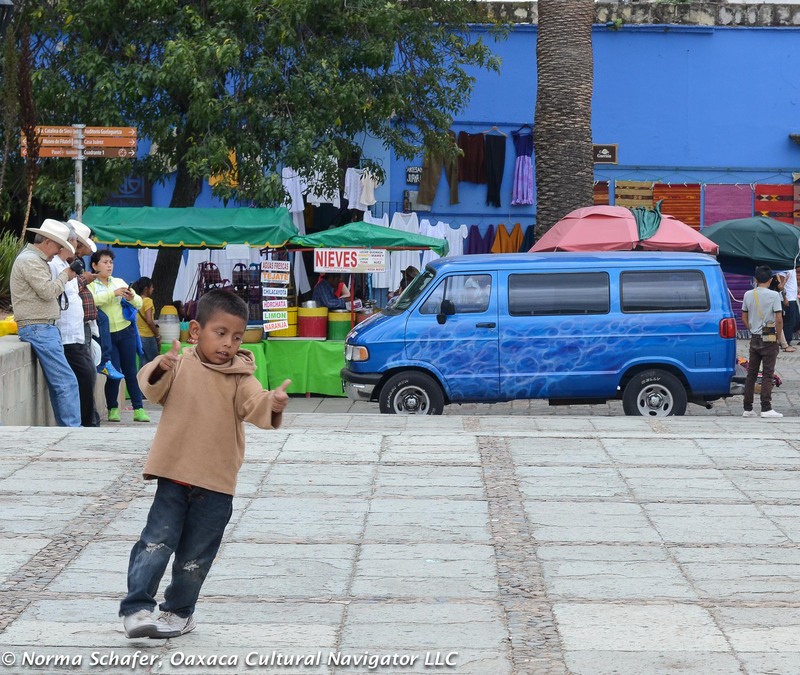 Can’t wait to see what Oaxaca looks like. Excited ad do very happy to be here. Thanks, Norma, wish we could be there! Maybe next year, Olive. It’s a great time here. one with the retractable ceiling? If it is, we ate there on 2 occasions….very nice!!!!! Susanne, yes. I has a retractable roof and a concrete zigzag wall and good food!